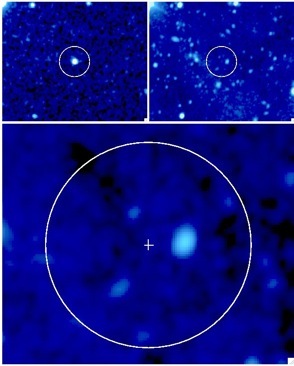 GRB (gamma ray burster) 070125. Credit: B. Cenko, et al. and the W. M. Keck Observatory. So what is a “dark star”? It is not a Newtonian black hole as suggested by John Michell in the 18th century who used the term while postulating that gravity could prevent light escaping from a very massive, compact star. It is not a “dark energy star”, which is related to a black hole, but rather than having a singularity at the center, quantum effects cause infalling matter to be converted to vacuum state energy, dark energy. It is not a comic book, science fiction comedy film, or Grateful Dead song. In this blog entry we are writing about dark matter powered stars. These would be the very first stars, formed within the first few hundred million years of the universe’s existence. The working assumption is that dark matter consists of WIMPs – weakly interacting massive particles, in particular the favored candidate is the neutralino. The neutralino is the lightest particle among the postulated supersymmetric companions to the Standard Model suite of particles. As such it would be stable, would not ordinarily decay and is being searched for with XENON, CDMS, DAMA, AMS-02 and many other experiments. The first stars are thought by astrophysicists to have been formed from clouds of ordinary hydrogen and helium as well as dark matter, with dark matter accounting for 5/6 of the total mass. These clouds, called “dark matter halos” are considered to have contained from about one million to 100 million times the Sun’s mass. The ordinary matter would settle towards the center as it cooled via radiation processes and the dark matter (which does not radiate) would be more diffuse. The stars forming at the center would be overwhelmingly composed of ordinary matter (hydrogen and helium nuclei and electrons). Without any dark matter at all, ordinary matter stars up to about 120 to 150 solar masses could form; above this limit they would have very hot surfaces and their own radiation would inhibit further growth by infall of matter from the halo. But if as little as one part in a thousand of the protostar’s mass was in the form of dark matter this limitation goes away. The reason is that the neutralino WIMPs will, from time to time, meet one another inside the star and mutually annihilate since the neutralino is its own anti-particle. The major fraction of the energy produced in the annihilation remains inside the star, but some escapes in the form of neutrinos (not neutralinos). Annihilation of these neutralinos is a very efficient heating mechanism throughout the volume of the star, creating a great amount of heat and pressure support, basically puffing up the star to a very large size. The stellar surface is, as a result, much cooler than in the no dark matter case, radiation pressure is insignificant, and accretion of significantly more material onto the star can occur. Stars could grow to be 1000 solar masses, or 10,000 solar masses, potentially even up to one million solar masses. Their sizes would be enormous while they were in the dark matter powered phase. Even the relatively small 1000 solar mass star, if placed at the Sun’s location, would extend through much of our Solar System, beyond the orbit of Saturn. We have mentioned the neutralino meets neutralino annihilation mechanism. A second mechanism for heating the interior of the star would be direct impact of neutralinos onto protons and helium nuclei. This second mechanism could help sustain the duration as a dark matter powered star potentially even beyond a billion years. Eventually the dark matter fuel would be exhausted, and the heat and pressure support from this source lost. The star would then collapse until the core was hot enough for nuclear fusion burning. Stars of 1000 solar masses would burn hydrogen, and later helium, and evolve extremely rapidly because of the high density and temperature in their cores. After their hydrogen and helium fusion cycles completed there would be no source of sufficient pressure support and they would collapse to black holes (or maybe dark energy stars). It is calculated with detailed simulations that the dark star mechanism allows for much more massive stars than could be formed otherwise, and this provides a potentially natural explanation for the creation of massive black holes. Our own Milky Way has a black hole around 3 million solar masses at its center, and it appears a majority of galaxies have large black holes. The image at the top of this blog is of a gamma ray burst detection that may have come from a large black hole formation event. This entry was posted on Saturday, June 4th, 2011 at 10:41 pm	and tagged with Dark matter, dark matter annihilation, first stars, neutralinos, WIMPs and posted in Dark Matter. You can follow any responses to this entry through the RSS 2.0 feed. Gravity, Dark Matter and why we're wrong.